Odds are, your state has adopted the Common Core State Standards. You know how the standards emerged, what they cover, and how they are organized. But how do you translate the new standards into practice? 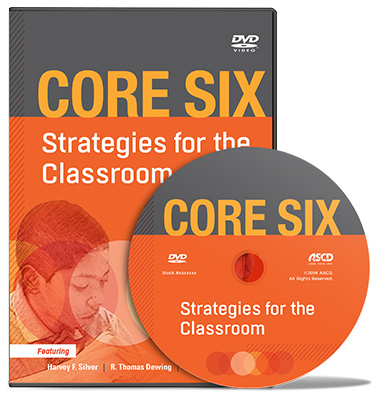 Enter the Core Six: six research-based, classroom-proven strategies that will help you and your students respond to the demands of the Common Core. 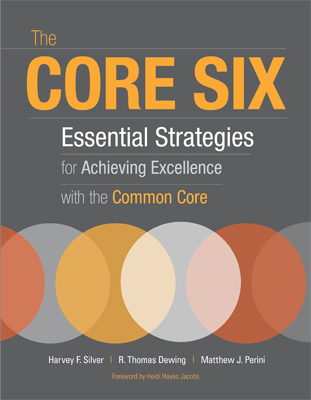 "If you are on a quest for a simple, straightforward book that gives teachers high-yield teaching strategies for the common core implementation efforts, then The Core Six: Essential Strategies for Achieving Excellence with the Common Core is a solid choice." —John Robinson, principal, Newton, N.C.
Harvey Silver talks about his best selling book, The Core Six: Strategies for the Classroom, outlining how capturing students' interests, using discussion and questioning techniques to extend their thinking and asking students to synthesize and transfer their learning. HARVEY F. SILVER is president of Silver Strong & Associates and Thoughtful Education Press. He has conducted numerous workshops for school districts and state education departments throughout the United States. He was the principal consultant for the Georgia Critical Thinking Skills Program and the Kentucky Thoughtful Education Teacher Leadership Program. Find out more about Harvey Silver's work. R. THOMAS DEWING has spent more than 35 years in public education as an elementary and middle school teacher, principal, instructional coordinator, and educator of gifted students. He has also taught education courses at National Louis University and North Central College. MATTHEW J. PERINI is director of publishing for Silver Strong & Associates and Thoughtful Education Press. He has authored more than 20 books, curriculum guides, articles, and research studies covering a wide range of educational topics, including learning styles, multiple intelligences, reading instruction, and effective teaching practices.